Wrought iron is softer to forge, but it is it’s incredibly longevity that makes it an incredibly effective fence material. To the naked eye there is no discernible difference between wrought iron and mild steel, though wrought iron offers many benefits due to its nature as a corrosion resistant and strong fence material. Wrought iron is softer to forge, but it is it’s incredibly longevity that makes it an incredibly effective fence material. 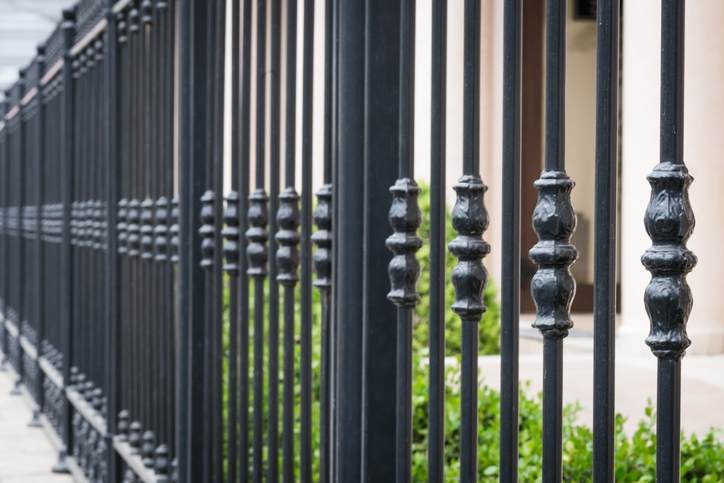 While wrought iron will corrode under certain circumstances, its ability to stand the test of time is almost unprecedented. Many charming Victorian townhouse railings are made of wrought iron that’s over 200 years old. The famous and huge ornamental wrought iron gateways to eighteenth century houses contain wrought iron detailing that’s 300 years old. The stone cramps on Tudor bridges are made of wrought iron that’s over 500 years old. A large amount of ornamental wrought iron fence and decorative work has survived hundreds and hundreds of years with little to no maintenance. In comparison, mild steel corrodes rapidly. Why Is Wrought Iron Superior? Wrought iron is so corrosion resistant due to the presence of slag in the material itself. During the manufacturing process, wrought iron does not become molten, unlike more highly refined metals. This means that impurities remain in the iron rather than being separated and discarded. At the high temperatures used in manufacturing these impurities turn into glass or what is known as slag. Slag gives wrought iron its fibrous and corrosion resistant structure and properties. How Do Slags Stop Corrosion? Slags cannot be corroded, so they halt the natural process of corrosion effectively. The structure of iron also gives it its well known rough surface texture. This surface interlocks with the oxide layer and prevents it from flaking off the surface and causing damage and corrosion. Mid-Atlantic Deck & Fence is ready to help with your wrought iron fence needs! Mid- Atlantic Deck and Fence has been building custom fences and decks throughout Maryland since 1987. We also offer gazebos, pagodas, and screen porches. We are one of Maryland’s leading and most innovative deck and fence companies. Click Here to request an estimate for your fence today! Mid-Atlantic Deck and Fence offers many different styles of standard fencing and decking, as well as custom built designs to choose from. We are also one of Maryland’s only manufacturers and installers of vinyl fencing. If you have any questions about decking in Baltimore, please contact Mid-Atlantic Deck & Fence (MAD Fence) today by clicking here or calling 1-800-833-9310.